A North Korean ICBM crashes into the Sea of Japan. A veteran CIA officer is murdered in Ho Chi Minh City, and a package of forged documents goes missing. The pieces are there, but assembling the puzzle will cost Jack Ryan, Jr. and his fellow Campus agents precious time. Time they don't have. The challenge facing President Jack Ryan is an old one with a terrifying new twist. The international stalemate with North Korea continues into its seventh decade. A young, untested dictator is determined to prove his strength by breaking the deadlock. Like his father before him, he hangs his plans on the country's nuclear ambitions. Until now, that program was impeded by a lack of resources. However, there has been a dramatic change in the nation's economic fortune. A rich deposit of valuable minerals have been found in the Hermit Kingdom. Coupled with their nuclear capabilities, the money from this find will make North Korea a dangerous force on the world stage. There's just one more step needed to complete this perfect plan...the elimination of the president of the United States. "The action scenes alone come across beautifully, as visual as anything on a movie screen, with the added enticement of crisp, accurate and hard-driving prose." "Once again, the acrid scent of cordite wafted through my imagination during the climactic gun battle as Clancy's characters from the world of intelligence achieved yet another victory over the forces of evil." Tom Clancy was the author of eighteen #1 New York Times-bestselling novels. His first effort, The Hunt for Red October, sold briskly as a result of rave reviews, then catapulted onto the bestseller list after President Ronald Reagan pronounced it "the perfect yarn." Clancy was the undisputed master at blending exceptional realism and authenticity, intricate plotting, and razor-sharp suspense. He died in October 2013. Mark Greaney has a degree in international relations and political science. 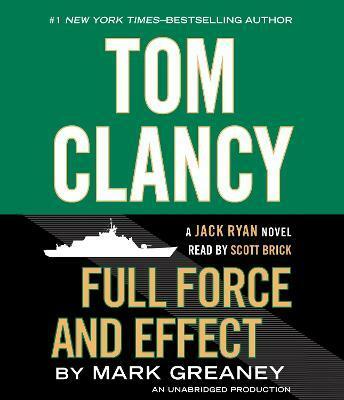 With Tom Clancy he is the coauthor of Locked On, Threat Vector, Command Authority, and Support and Defend. He has written four books in his own Gray Man series: The Gray Man, On Target, Ballistic, and Dead Eye. In his research for these novels, he traveled to more than fifteen countries and trained alongside military and law enforcement in the use of firearms, battlefield medicine and close-range combat tactics.